Every student does it. Crazy Taxi. Curveball. Bubble Shooter. It’s a game of cat and mouse. Can kids get away with playing games secretly on their computer in class while they are supposed to be doing school work? Can teachers outsmart their crafty pupils and force them off these sites? Every day is the same battle. Kate Harrold looks out for a teacher as she plays the Helicopter game. With the luxury of using a computer in some classes, right away, teachers attempt at giving some sort of intimidating caution with this rare school-day privilege. A lot of students silently scoff at these typical warnings and jump on their favorite, accessible gaming site as soon as their computer screens are out of the peripheral vision of their instructor. This double tab strategy seems to be used by many, but not stealthily enough to fool most teachers. Whether it’s Gold Miner, Helicopter, Tetris, or Penn Manor’s classic, Bubble Shooter, kids love the mischievous thrill of playing these hard-to-find games on Penn Manor’s limited web access that they wouldn’t normally play at home during their leisure time. 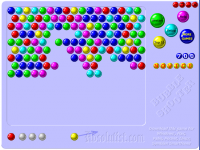 Bubble shooter may be the most popular "underground" game for Penn Manor students who are blocked from most game sites at school. “It’s an accomplished feeling when you click out of your game when the teacher walks by you and you don’t get caught,” confessed Penn Manor senior Steven Resch. Because the web access is so restricted, kids go as far as bringing in flash drives that have their favorite games on it. Jackson’s flash drive unfortunately became a victim of his washing machine, halting this subversive arcading tactic. Just recently, www.grygry2.com (kids – don’t bother trying) which had arguably been Penn Manor’s default arcade sanctuary, was blocked. Uproar in Penn Manor’s underground world of online gaming began when this site went down. Senior, Kenneth Tomaszefski says, “Grygry2 was the sun that started my morning in my class.” Tomaszefski was an active user of grygry2 along with many of his friends. “When grygry2 went down, my heart went down with it,” says Tomaszefski. Head of technology in the district, Charlie Reisinger was tracked down during this secret time of despair for many of Penn Manor’s gamers. Reisinger ended the popular notion of there being some guy sitting behind a desk watching every site students visit and stopping any distracting or inappropriate sites from being viewed. “A computer called the 8E6 is a sort of filter that looks [at everything that flows through the districts online web], and compares each site to the districts block list,” says Reisinger. “The computer gets smarter with every site that it blocks and recognizes any future sites that are similar with prior blocked sites,” says Reisinger. Teachers and students are doubtful the 8E6 will win this battle of man versus machine, it won’t stop kids from trying to quench their thirst for danger and having fun doing it. Great article! My game of choice is cube field. Yeah I mess around on the computer a lot while I’m in class… like right now I’m on Penn Points.